Following on, I thought I’d run over a method I use to make sure that when I begin work on an edit and start to go through my material - that I do it efficiently. Subclips & Search bins are a great way of to do this. Recently I shot a job at the BVE 20109 in London. The purpose of which is to create highlights promo for MediaCity Training & Adobe. I filmed shots of the exhibition stands, nice looking production kit, people talking together etc. Basic GVS of the event. I also shot some talking head shots of people involved. This is typical of about 99% of the type of content which I work on, whether it be short form event promo type stuff, or documentary long-form. Essentially - the edited product ends up being a combination of soundbites & GVS. The time consuming bit in the edit, is actually going through the interviews and deciding which bits of each interview will go where. That’s where the subclip method comes in. I usually approach these edits by creating my project, and making all the bins I need. A subclip is a smaller chunk of a larger clip, and it’s great because you can name it so it’s specifically relates to what is being said. For example - pretty much all of the interviewees mention they are at BVE, and then they describe the event, and say something about who else is attending. Then they go on to talk about their particular involvement in the event, why they’ve come to attend, and so on. As I go through my interviews I begin to fill the subclip folders with nice, easy to organise soundbites which can then be used to flesh out the edit on the timeline. When working on things such as longform documentaries, there can often be a lot of different contributors speaking - and often long interviews which can go on for ages - and so this approach allows you to view, digest, manage and organise those interviews in an efficient manner. It also means you really only need to fully view the interviews once, because after having created the subclips you know what you’re working with, and where everything is. The cool thing about doing it like this, is that if the material is brand new to you you will start to see themes emerging. It’s a good idea to have a notepad handy, so you can jot down elements of each clip that stand out to you. This is my go to method for working now, I find it the best way of really getting a feel for the material. There is also another great advantage to dealing with your material in this way - and that’s when using it in conjunction with search bins. A search bin is a live bin (sort of like a watch folder), that you can allocate search term criteria to. Certain themes will emerge such as ‘event description’ or ‘benefits’, ‘reasons to visit’ etc. Obviously each project will be different - but common themes will definitely emerge. 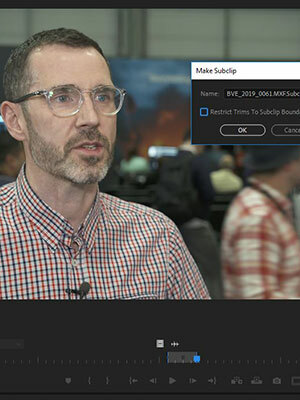 Once you’ve set up a search bin - whenever that specific term is used in the description of a subclip - Premiere will automatically place that clip in that search bin. This means that when you’ve done your subclipping for all of your interviews (and even if more come in after the fact) you’ll have search bins full of all of your contributors commenting and speaking on whichever theme or topic you used to create them. And you can then start to build the edit, cutting to and from each contributor talking about those specific bits. This technique works well for short & long form alike. And it's especially good for repurposing or making amendments. If you’ve ever got stuck into an edit, then thought - ‘I know that guy said something about this bit somewhere’ and had to search back through an hour long interview for it, you’ll hopefully appreciate how useful might be..!